This week’s bitcoin review takes a look at a new research paper that examines the relationship between social media interactions and the bitcoin market. Anyone who has followed bitcoin over the last three years knows that its price is an ad nauseum repeat of price spikes followed by mini crashes. Some of them have been triggered by external stimuli, like MtGox being hacked in 2011 before it ultimately met its demise this past March. The cycle — more like a roller coaster — of bitcoin price movements is becoming an interesting research topic for academics. However, how much of the price fluctuation has to do with the hype around the cryptocurrency? Researchers at ETH Zurich, a university in Switzerland, decided to study how social information online affected the price in their paper “The digital traces of bubbles: feedback cycles between socio-economic signals in the bitcoin economy.” The researchers looked at Facebook shares, number of tweets, number of downloads of the blockchain client, users on the network and the number of searches on both Google and Wikipedia to try to find a correlation between the price and the online network. 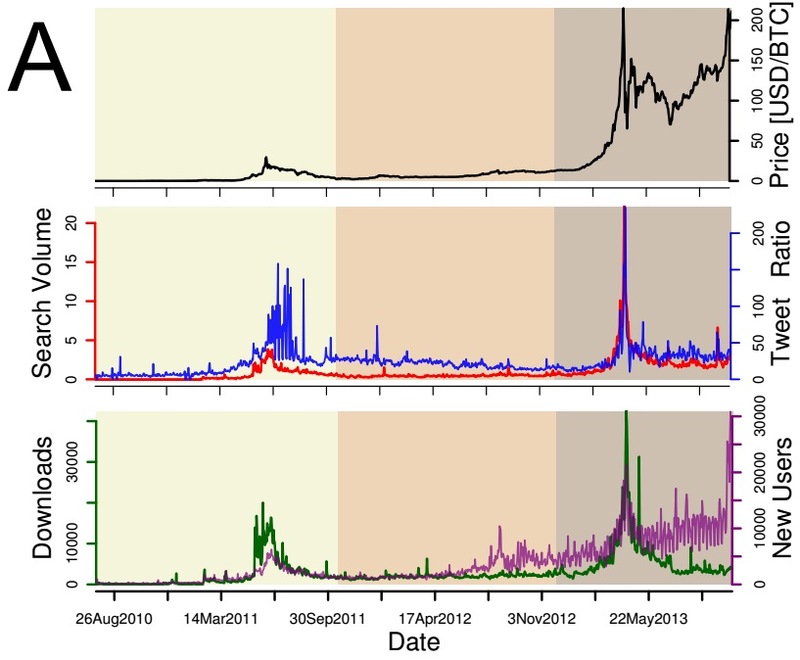 Figure A from the research paper shows the Time series of price (black) on MtGox (top), number of Bitcoin-related tweets per million tweets (blue), search volume (red) on Google (middle), and the number of downloads of the bitcoin client (green) over the three years of analysis. In the “social” cycle, search volume increases with price, driving social network activity and increasing the price. In the “user adoption” cycle, search volume increases with price, increasing the interest of new users and then the price increases from increased adoption and a larger user base. The study though doesn’t take into account the events of 2014. Since the end of last year, the bitcoin price has fallen to hover around $600 (see the graphics below) and has weathered several events such as the MtGox bankruptcy and the US Marshals’ auction. It would be interesting to see if the same trends were present as the price was falling instead of just spiking like it was in 2013. Regardless, when it comes to predicting to bitcoin price, this paper may prove that checking Google trends may have more validity than checking your crystal ball. The price never quite crossed the $600 mark this week, but it’s been holding pretty steady. It’s now been two months where the price has stayed somewhere between $550 and $650, so this could be the new normal for bitcoin. An attacker has been redirecting internet traffic to mining pools to himself, walking away with around $83,000, according to a new research report. In direct contradiction to bitcoin’s anti-government background, Ecuador is creating its own virtual currency, which could be introduced as early as October, Bloomberg reported. Switzerland is known for its neutrality — and that may extend to its view on cryptocurrency. The Wall Street Journal wrote about the “mecca” that Switzerland has become for bitcoin enthusiasts, especially as the U.S. and Europe begin to contemplate regulations. Retailers who accept bitcoin love it, according to Mashable. And they’re likely to love it even more as the barrier to entry gets lower and lower. It’s still likely a long ways off, but a Visa exec did hint that their network could accept bitcoin, CoinDesk said. The Bitcoin Foundation wants more time to respond to New York’s proposed BitLicenses. The New York Times wrote that the foundation requested at least an additional 45 days but is campaigning for a full six-month comment period. The 45 day comment period started on July 23.